The argument over ‘was Tyrannosaurus (or big tyrannosaurs) a predator or scavenger’ has been going on for far too long and is, I think, not only dull, but largely pointless. It rather assumes that they were one or the other, when pretty much no carnivore is, what they are, is both. Jackals might favour scavenging and lions predation, but jackals hunt and lions eat random carcasses. Where a given carnivore (or even omnivore) lies on the scavenger-predator spectrum is of interest, but still not worthy of the coverage Tyrannosaurus has had on this subject. Interesting though a great many papers have been on the subject, and clever and intriguing that many analyses have been, getting the ‘answer of predator or scavenger was never likely to be satisfactory *because* the answer was always very likely to be ‘both’. All of this has recently been reviewed and covered by Tom Holtz and thus the book might appear to be closed on the subject, since both are in evidence. But there is always room for more data, especially when it comes from a new fossil find. Predation has long been in evidence for tyrannosaurs what with various healed bites and even teeth wedged into the bones of surviving meals. Certainly they tried to kill and eat living herbivores on occasion. But scavenging is by definition rather harder to generate. You might find a totally mutilated carcass where every bit of possible nutrition has been extracted such that even the bones have been eaten (or at least ‘gnawed’ at) but was this a scavenging event or did the predator have a very leisurely time over the meal and was able to effectively destroy the prey item. Hyena are indeed predators but a pack will leave little but horns after having killed an antelope just as they would if they found a dead one on the plain. So while there are several incidences of bodies having been seriously got-at by tyrannosaurs it’s been difficult to *really* be totally confident that they represent scavenging. For the record, I think they do, but there has naturally been some doubt about it. What you really need is a body which could not have been killed by a tyrannosaur, but was still fed on by one. What you need is something like the specimen presented in my new paper. This is a humerus of the hadrosaur Saurolophus from the Late Cretaceous of Mongolia that is covered by bites from a Tarbosaurus. Tarbosuaurs is a giant tyrannosaur that rivals Tyrannosaurus in size (though is generally a bit smaller with a narrower skull) and indeed the two are very close relatives. We can match up the spacing of the tooth marks with the tooth spacing of the jaws of Tarbosaurus, some marks are deep implying a large carnivore was at work (and it is the only thing around at that time that could deliver such a bite) and other specimens are known in the Formation. 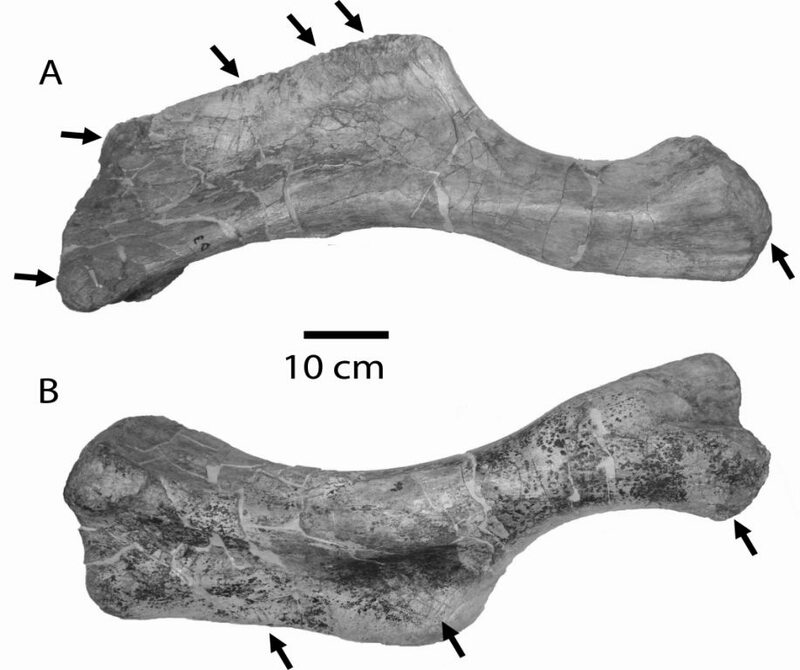 It’s the only reasonable candidate and thus we have a good idea of both feeder and feed-e.
Saurolophus humerus with tyrannosaur bite marks. From Hone & Watabe, in press. We know the humerus is from a Saurolophus because, critical bit, nearly the whole skeleton is preserved. And it’s in superb condition, one of the best I have ever seen, even from a place that often yields superbly preserved material. To be more specific, the humerus is the only thing with any marks at all on it and there are dozens of bites and scrapes. How could this have happened? Well that hadrosaur was found it what was, when it was buried, a river channel. And that humerus was uppermost on the skeleton and had suffered not only tyrannosaur-based damage, but also a little erosion. We hypothesizes therefore that the animal died in the channel, or more likely died elsewhere and came to rest at that point. It was then covered by sand such that only the arm (which may or may not have lost the lower arm) was on the surface. Along comes a large Tarbosaurus who makes as much as a meal as is possible and leaves his teeth marks behind but not much else. There’s a little more evidence to come too since it seems unlikely that a large tyrannosaur would pick on one part of the body to this degree and leave the rest alone (no other tooth marks). Furthermore, living carnivores usually go for the legs and belly first and the arms close to the end of their feeding cycle (since there’s less meat there). The only obvious explanation for such dedicated feeding on one, relatively small, and atypical part of the skeleton is that this was the only option. In short, the animal was already dead and buried with only the humerus exposed (suffered weathering when the rest did not) and this is therefore scavenging. The paper is open source so you can download and read it here for even more details. I’ll be posting more tomorrow too on the fascinating selective feeding strategies of tyrannosaurs. One last comment in passing, in the reviews for this paper one referee got to the point where we claimed that this was pretty definitive evidence of scavenging and left the note “Finally!”.We all assumed that tyrannosaurs would and did scavenge and we already had pretty good evidence that they did, but this paper hopefully does provide a fair shove in this direction to show it really did happen. Tyrannosaurs were indeed scavengers, *and* predators. selective feeding behaviour of tyrannosaurs. Acta Palaeontologica Polonica. More to come tomorrow, with good coverage also at New Scientist and Live Science. Fare less good coverage alos present on the web if you look. Good article Dave. The only mystery really is why this argument has gone on for so long. I’d like to see this Saurolophus specimen (not just the humerus!) – any chance of an image or two in the future or is it still under embargo? No idea why this carried on the way it did, not my fault! 😉 Tom Holtz’s 2008 review on this very issue is good. Sorry, the rest of the Saurolophus is being described by another group (so I was rather lucky to be allowed to ‘extract’ the humerus as it were). Yes it is, an absolute cracker with even small things like distal caudals and chevrons and the skull is wonderfully detailed. I don’t actually know who is doing the write up on that or when it will ever come out. Given that Jack Horner is pretty much the only guy who ever argues for the _T.rex_ is a scavenger position, is that really much of a debate at all? I mean the “birds are not dinosaurs” camp has more members in it than the _T.rex_ is a scavenger camp, and everyone pretty much ignores those guys. 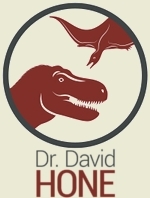 The only reason why I can think that this “debate” is still going on, is because Horner is also a TV personality, and controversies bring in ratings, which in turn bring in money that can ultimately be used to fund future paleo projects. great to see all your accurate non-blow-up science reporting dreams are(n’t) coming true! Mind you, my write up leans toward chocolate eating dinosaurs so I’m not sure I can be held up as a bastion of accuracy! “Tyrannosaurs were scavengers, not predators”? “Hone Watabe”??? I’m out of breath now from laughing so hard. Yup, JP was a huge breakthrough in dinosaur research… it took Spielberg to discover that frill on Dilophosaurus! I’m so pleased this paper is open source. But perhaps more importantly I want to congratulate you on the readability. As a content writer with absolutely no background in anatomy, geology or palaeontology I definitely appreciate a paper in which the information presented is done in a manner that is dynamic and straightforward. While I understand that I am definitely not the target audience, the ability of lay people to understand and begin to comprehend the science gives us impetus to seek out other works instead of being discouraged with our lack of knowledge and education. If that should come to pass I’d be honoured to meet you. Hi Teresa, thanks for the wonderful comments. In this case at least the paper does lead itself to readability since the subject is simple and straight forward and deals with familiar terms – there’s almost no technical information required. So sorry you missed the IVPP, though you would have missed me too since I’m actually in the UK this week. Best of luck with your work, and enjoy Henan. Nitpicking here, but since when are jackals primarily scavengers? I thought their diets centred around small animal hunting, with scavenging as a sideline. Ah yes I’d forgotten how predatory some of them can be, thanks for that. Though as you say, it hardly detracts from the original point.